He took us across the tee we were using, through some undergrowth and pointed to a tee box hidden a farther 30 yards in the distance. He had a point. Last year, I was invited to play in a charity golf event by a friend of mine. 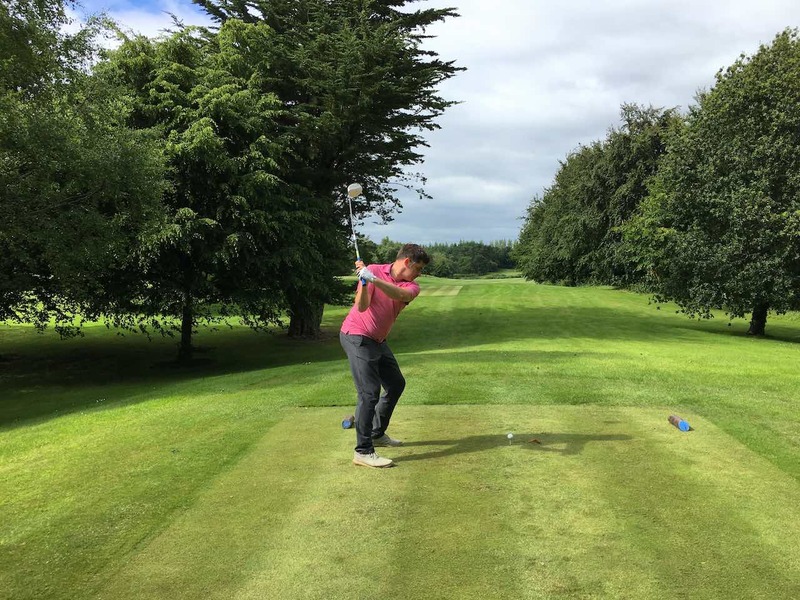 Darren Murray has become very committed to Mellon Educate – a charity that builds schools in Africa and improves education for African children. He headed out there and was deeply involved in the charity’s work. He still is, which is why he’s hosting another charity golf day on Saturday August 26th, 2017. Done and dusted. The Dubai Duty Free Irish Open is over for 2017, and the winner was a worthy one. 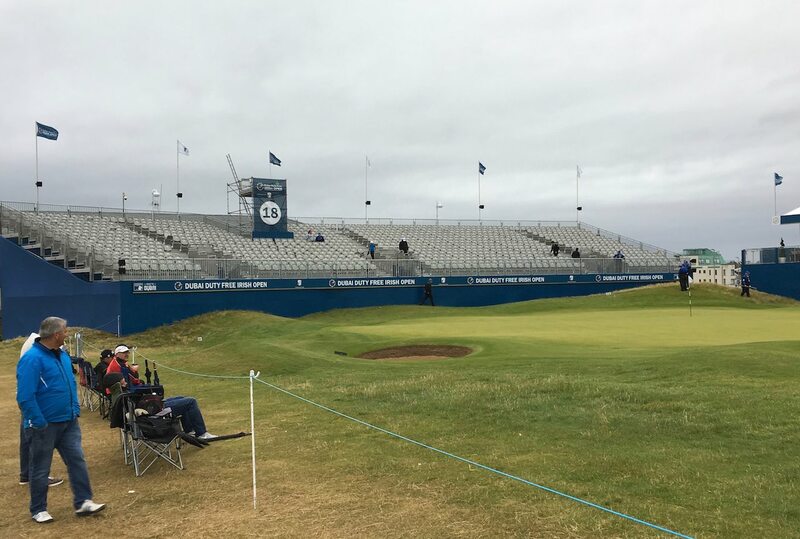 Rahm pulled away comfortably after that remarkable eagle on the par five 4th hole and it was catch up for everyone thereafter. Despite the afternoon rain, the scoring was exceptional. 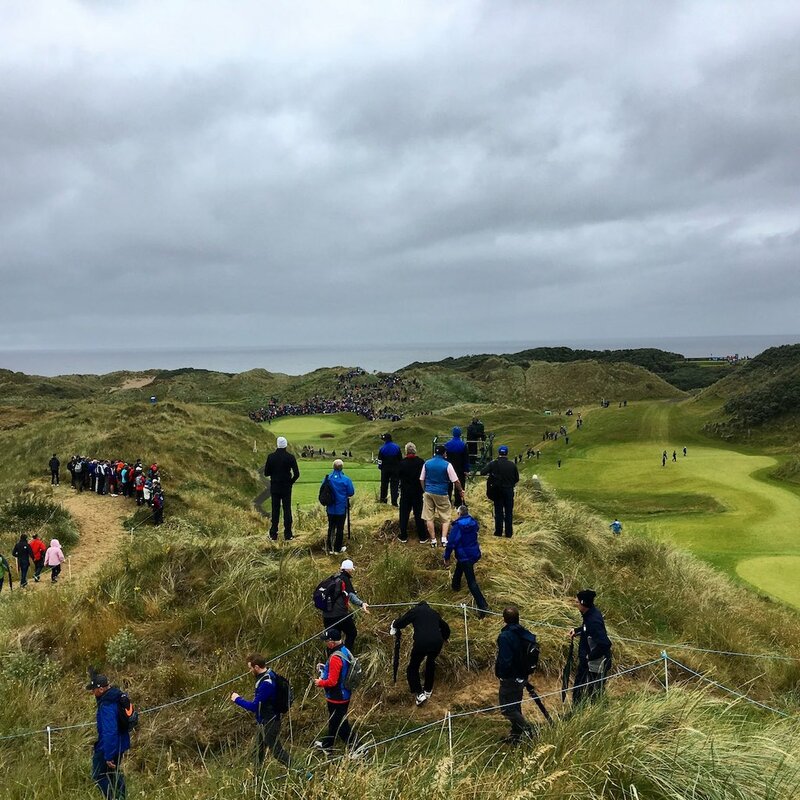 Rahm may have smashed records - his 24 under being the lowest of any Irish Open - but every Professional who played the weekend finished under par. It was thrilling to see, although, in my opinion, the weather conditions did not allow Portstewart to display the true test she offers. It mattered little. Portstewart looked fabulous and while Sunday was wet, Saturday delivered glorious sunshine and the 450 million people watching on TV around the world must have been over-awed by the coastline's beauty and the links course's charms. 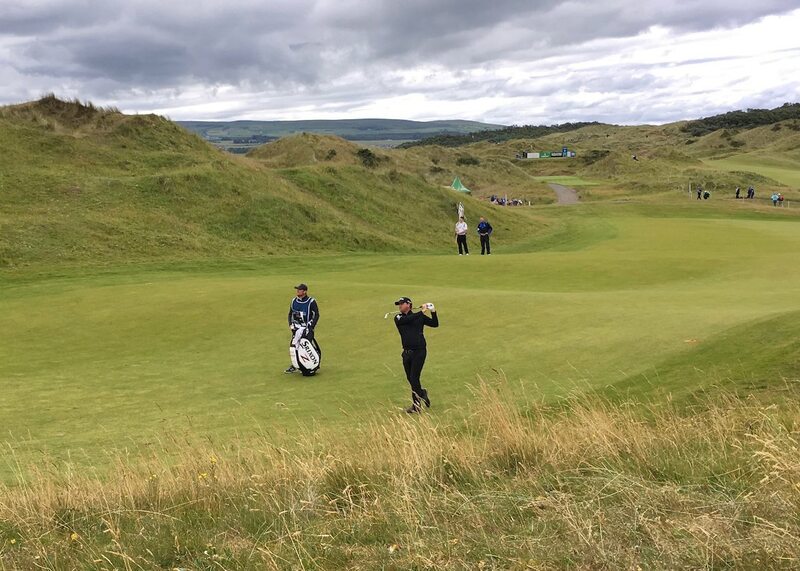 Those at the tournament certainly had a stunning day to remember... even if Ireland's golfers got left behind in the birdie blitz. are prepared to wait a couple of hours to get ringside seats. Sunday morning started quietly although that soon changed thanks to both Shane Lowry and Gavin Moynihan delivering fantastic rounds of seven under and eight under, respectively. 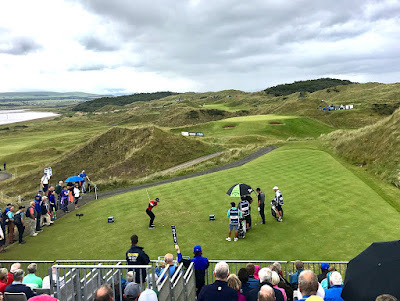 The Irish journalists were not on hand to witness the back nine of the two Irishmen as we were attending a media announcement to declare Ballyliffin as the host of next year's Dubai Duty Free Irish Open. 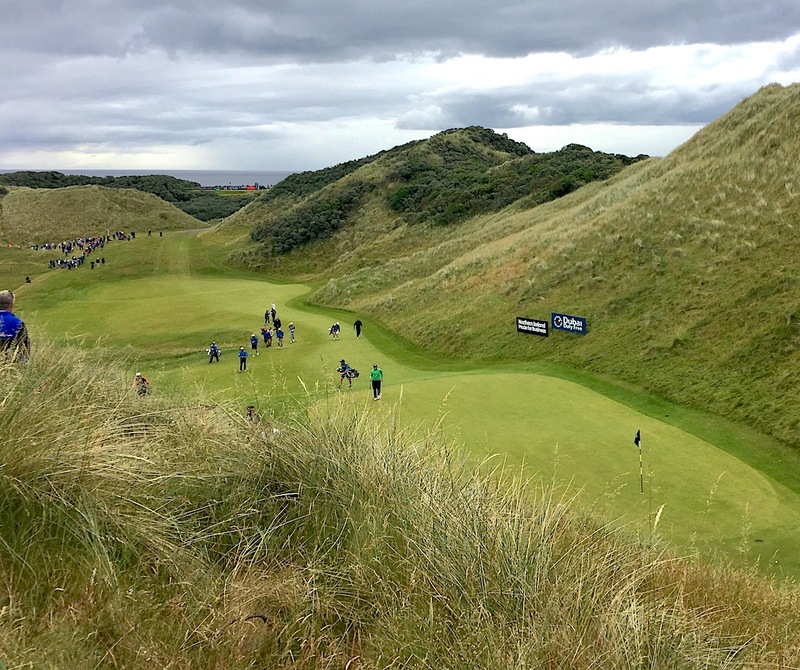 I did get to see Shane playing a delicate chip on 16 (below)... but that was it for those two Irish boys. 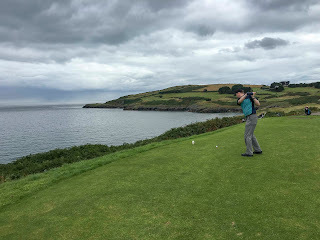 Being in the Media Centre, as part of the 'golf media' has been an interesting, enthralling and educational experience... so a thank you to both the European Tour and the Irish Examiner for giving me the opportunity. I got to see some fabulous golf... and some not so fabulous golf... meet and interview interesting people, and see first hand how an operation of this size is run. I tip my hat to the volunteers - the park & ride attendants particularly - who remained upbeat every day and met and helped everyone with a smile. Roll on next year when the remote beauty of Inishowen will be on display. Where's a Professional when you need one! Rain started the day; sunshine finished it. Tomorrow looks rather exceptional. The scoring was free and easy... even if Rory would disagree. The boy couldn't buy a putt and misses the cut once again. Birdies and eagles were flying thick and fast but the Holywood star and number four in the world managed just six in his 36 holes and countered that with five bogeys and a double. It's great to see some seldom seen names atop the leaderboard, while Rahm's presence is most threatening. One of the leaders is Frenchman Benjamin Hebert. In his post-round interview he was asked what has changed for him this week after some disappointing performances. His response was simple... he said he changed his shoes... and he was only half joking. The crowd swells as Rory approaches. Paul Dunne is one of many who continues to impress and while the Northern Irish representation is now limited to Michael Hoey (-4), the boys from south of the border number four: Lowry, Moynihan, Harrington and Dunne. Too many signatures? Two caps is the obvious solution. Hanson hits two perfect shots onto the 7th green. Easy birdie. The atmosphere seemed to ramp up a good bit today with attendance rising by 1,000. The loss of Rory may affect proceedings slightly, but there's still a lot to play for and a lot of excitement to come. What a cracking first day at the Dubai Duty Free Irish Open. I have to confess this is all a first for me and it's a blast. The Media Centre is packed with Irish golf writers, broadcasters and photographers and a load of international counterparts; the course is fabulous and the golf thoroughly entertaining. 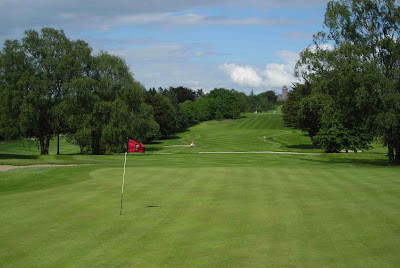 As a Greystones Golf Club man I am clearly invested in the progress of Paul Dunne but the whole place was buzzing and the Irish Open has stepped up one, if not two, levels thanks to the Rolex Series which has increased the prize fund to seven million dollars. Check out the Irish Examiner for Friday July 7th for my articles. 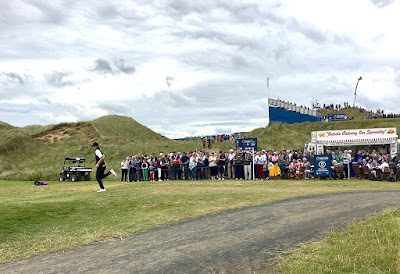 In the meantime, some photos - love the one of Tommy Fleetwood running to allow spectators to cross and mob the burger/hot dog bar that sits in the middle of the course (between holes 6 and 7). There are bars elsewhere too and the atmosphere is very relaxed... although come Sunday it probably won't be. of the day... he finishes 5 under despite some wayward driving. Kilkenny’s Mark Power holed out for eagle to claim a stunning victory at the end of a three-hole playoff with England's Jack Cope as he retained his Irish Boys title at Castletroy.